It contains clear explanation, examples..and exercises.I hope it will be useful. 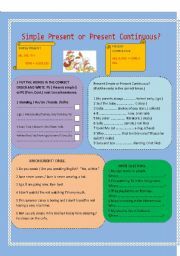 There are several exercises that might be useful to practice Pres.perfect tense. 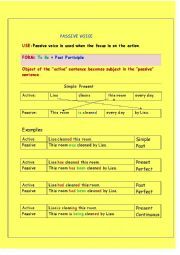 Students read the text, do T/F exercise,write some questions( Simple past Tense)and tney have to complete the table with the past forms of the verbs from the text. 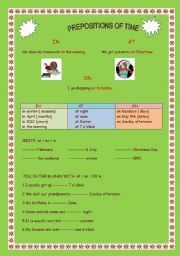 There are some exercises to practice the difference between the two present tenses.I hope you like it and find it useful! 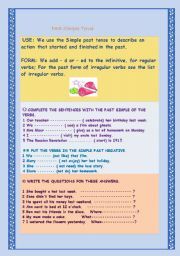 Past simple tense of regular and irregular verbs.Affirmative,negative and question form.The students have to complete the sentences with the correct form of the verbs in brackets,They have also to write some sentences about Sara�s holiday. Students have to choose the right option out of three. I hope you like it and find it useful. 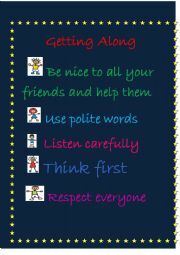 It can be used as a poster or a simple activity. I hope you like it!